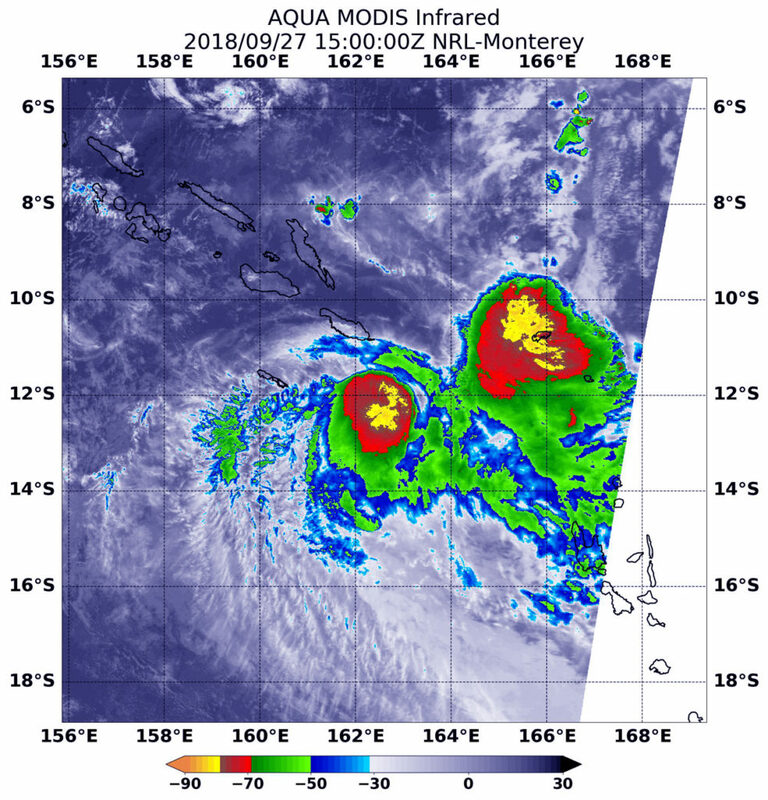 NASA’s Aqua satellite provided an infrared look at a new storm that formed in the southern Pacific Ocean called Liua and saw strongest storms off-center. At 11 a.m. EDT (1500 UTC) on Sept. 27, the MODIS or Moderate Resolution Imaging Spectroradiometer instrument aboard NASA’s Aqua satellite looked at Tropical Storm Liua in infrared light. MODIS found two areas of coldest cloud top temperatures west and northeast of Liua’s center were as cold as or colder than minus 80 degrees Fahrenheit (minus 112 degrees Celsius). Those areas represented the strongest storms. Surrounding them were storms with cloud tops as cold as or colder than minus 70 degrees Fahrenheit (minus 56.6 degrees Celsius). NASA research has found that cloud top temperatures as cold as or colder than the 70F/56.6C threshold have the capability to generate heavy rainfall. At 11 a.m. EDT (1500 UTC), the center of Tropical Storm Liua was located near latitude 12.2 degrees south and longitude 162.5 degrees east. That’s about 471 miles northwest of Port Vila, Vanuatu. Liua was moving toward the south-southwest. Liua’s maximum sustained winds were near 40 mph (35 knots/62 kph) with higher gusts. The Joint Typhoon Warning Center noted that the forecast takes Liua west over cooler sea surface temperatures and where outside winds will weaken the storm. Liua is forecast to dissipate by Sept. 29.